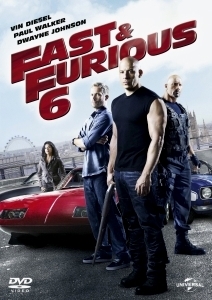 A bona fide box office hit (after a whopping $238 million domestic gross), Justin Lin’s Fast & Furious 6 (2013) is the latest entry in the successful franchise, available now on DVD and Blu-ray. While it doesn’t quite reach the same giddy, goofy heights as its Rio-set predecessor, there’s still much to enjoy here for those looking for a fun, frivolous night of small-screen entertainment. A ridiculously OTT interrogation scene minutes in lays waste to the slightest semblance of reality as US Secret Service Agent Luke Hobbs (a returning Dwayne Johnson) follows up a London hijacking perpetrated by felon Owen Shaw (Luke Evans). In order to bring Shaw down, Hobbs enlists the help of old adversary-turned-friend Dominic Toretto (Vin Diesel), who agrees to help in exchange for full amnesty for himself and his crew. Toretto’s Ocean’s Eleven-style team are reassembled, although matters are complicated when he learns that old-squeeze Letty (Michelle Rodriguez), whom he previously believed was murdered, is one of Shaw’s partners-in-crime. Each successive film in the franchise seems intent on upping the ante when it comes to stunt work and automotive mayhem, and Fast & Furious 6 is no exception. The complete absence of any laws regarding motion and physics positions it somewhere close to another summer biggie, Man of Steel. Lin’s cast are asked to continually deliver the kind of macho, po-faced dialogue and clunky exposition which sounds like a greatest hits from every similar action film from the last couple of decades. There’s also a threadbare plot, which is needlessly convoluted and as simplistic as they come. Yet, it’s difficult to fault a film which has an inherent grasp of its own ridiculousness and one which willingly goes as far out of its way to entertain as possible. There’s certainly much fun to be had from the setting, if only to witness a near-deserted, blinged-up central London transformed into a frenetic, high-octane racing ground. The film’s gloriously daft climax is also a thing of wonder, taking place on the longest runway in history, and featuring a bunch of cars hang preciously from a huge plane like some kind of gigantic children’s mobile. Fast & Furious 6 is junk food cinema of the highest order (the archaic English stereotypes wheeled out do leave a bitter taste in the mouth), but it’s also an entertaining, light-hearted respite from the type of summer tent-pole features which were bogged down by a Dark Knight-like solemnity. Unlike those, this film never losing sight of its primary purpose to engage.